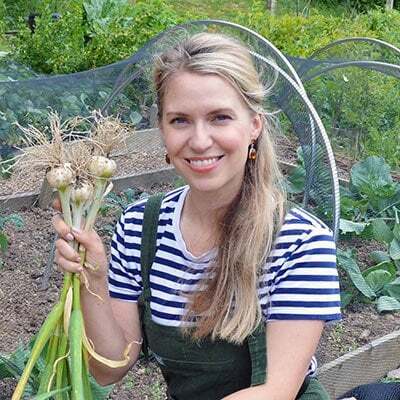 No matter where you garden, there’s a local bird eyeing up your homegrown vegetables. For many of us it’s pigeons, who are infamous for stripping cabbages down to the bare stem. Others have crows in their corn and for me it’s pheasants in everything. Early in the year they even dig up potato plants to get to the tubers. 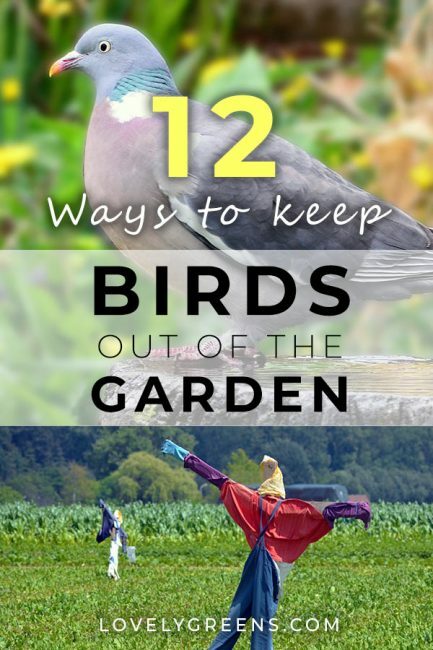 There are a lot of ways to keep birds out of the garden and some of them are drastic. Keeping tactics humane and as natural as possible is important for many of us organic gardeners and lovers of wildlife. Birds are part of the eco-system and we need to give them space to live. It just doesn’t have to be in our veggie patch. The most knowledgeable people on keeping birds away aren’t gardeners — they’re airport officials. Birds in airplane engines aren’t a good thing for obvious reasons and airports have made it their business to know how to keep birds out. One airport has even conducted a study on it. One of the most significant things to take from it is that birds aren’t stupid. They quickly realize that a scarecrow left in the same place for weeks isn’t going to harm them. It’s the same thing with any other ‘scaring’ method: pinwheels, ribbons, decoys, etc. If you’re trying to scare birds away, it’s important to switch things up. A scarecrow needs moving weekly and clothing and accessories changed or adjusted. Other scaring items like reflective CDs need to be placed in a space for the same duration then removed and reintroduced the next month in a different place. 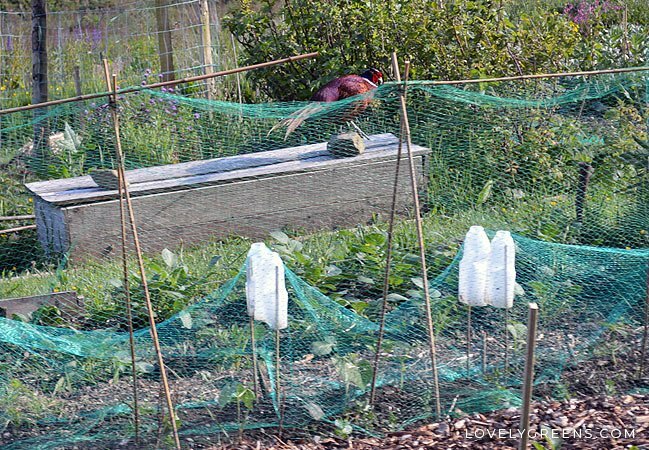 Creating barriers using garden netting is probably the most effective way to keep birds out. I use a variety of hoops in my garden and then pull butterfly netting over them. Butterfly netting protects crops from hungry wildlife but beneficial insects like honeybees can still get through to pollinate. Being careful and aware whilst using netting is very important. I keep mine pulled taunt, since loose netting is just asking for animals to get caught in it. Standard bird netting (with holes over 1cm) can be the most dangerous to wildlife. That’s the type that they can get caught up since they can more easily get a snout, head, beak, or leg through it. We once had a hedgehog get caught in netting in our allotment but it was fortunately freed. Other animals that get caught in netting include opossums, snakes, lizards and bats. In the worst case they die from netting injuries, in the best, you have to free them yourself. Another thing to keep in mind is that you should invest in high quality UV resistant netting that will last years. The common cheap green netting doesn’t have longevity — it shreds and breaks and causes a hazard to wildlife and the environment. 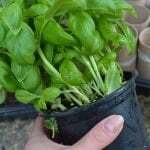 Chicken wire pinned to the ground can help protect newly sown seeds or planted tubers. It stops birds, including your own chickens, from scratching up the soil. As plants grow, you could lift the wire up on stakes or even bend it around hoops. Many of us use garden fleece to protect crops from frosts. It can also be used year-round to protect shorter crops from birds. Garden fleece is a fine white material that can be draped over pak choi, lettuces, chard, and other greens. Weigh the sides down with rocks or pegs and either reach under or roll it back temporarily to harvest. The most popular bird scaring product available is probably the terror eyes balloon. It’s a large, usually yellow inflatable ball with ‘eyes’ printed on it. You hang it in the garden and it moves slightly with the breeze. Both the movement and the eyes can startle birds into thinking a predator is watching them. If they don’t freak you out too, you can purchase one already made and for a DIY version, copy the eye patterns on a yellow beach ball. 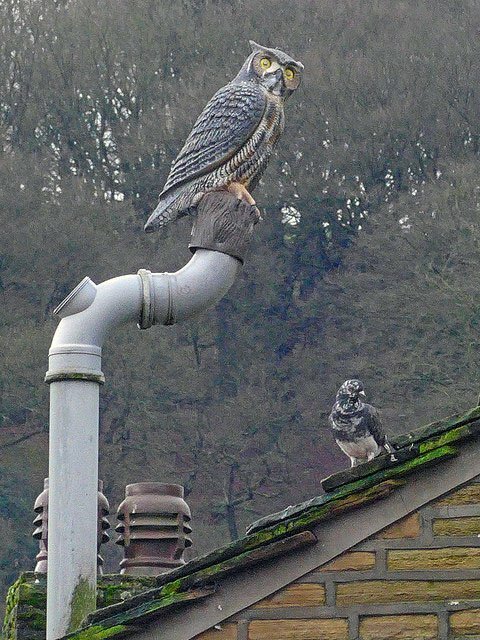 Some gardeners swear by having a plastic decoy owl or falcon mounted in their garden. Even unrealistic looking ones seem to have a decent effect on smaller prey birds like pigeons, sparrows, and blackbirds. They can also have little effect if they’re mounted someplace permanently. For best effect, move your decoy around the garden so that it looks like a predator bird taking up different stake-out locations. If you get a decoy that moves or makes sound, all the better. Another predator decoy that you can use are toy plastic snakes. Lay them in your garden beds and scare birds, animals, and yourself alike. 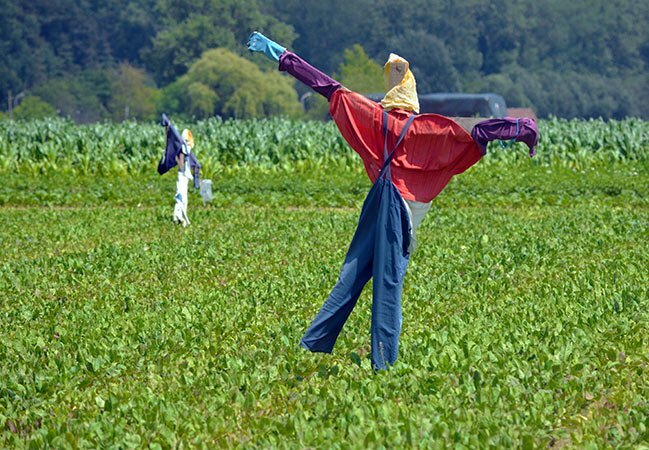 Scarecrows do work if they’re moved around regularly. Keep that in mind whether you’re buying one or making your own. 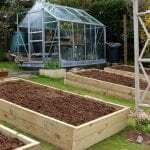 Opt for one built on a stake that can be pulled up and pushed into the ground in another part of the garden. It also helps to clothe or decorate them with the colours red and yellow. Some say that birds use these colours as flight triggers. Whether or not it’s scientifically proven, it wouldn’t hurt to have a Ronald McDonald in the garden. Unless you personally have a problem with clowns or garish garden decorations. Sudden movement will scare birds into flight as well. That’s why so many people use streamers, plastic bags, and garden spinners to keep birds out of the garden. Anything plastic that can be blown away in the wind can end up as litter so I won’t recommend the first two. 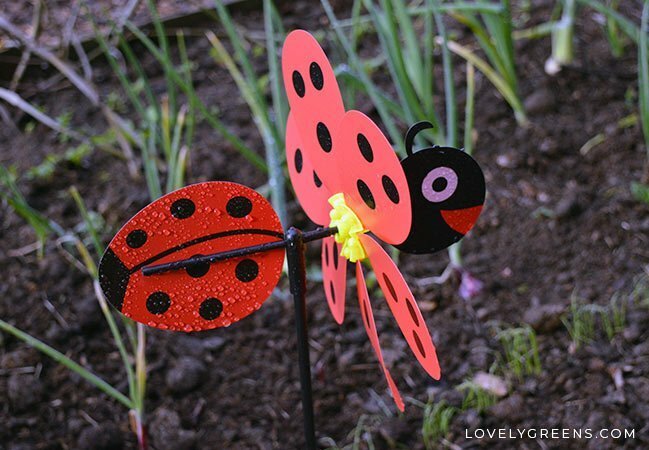 Sturdy garden spinners on the other hand can look cute and serve a purpose. Again, make sure to move them around the garden every week or so. I once saw a DIY birdbath decorated in a broken mirror mosaic. It certainly looked flashy but there certainly wouldn’t be any birds visiting. Aside from not being fans of sudden movement, they’re not fond of flashing light either. I think that lady accidentally found a way to keep birds out of the garden. 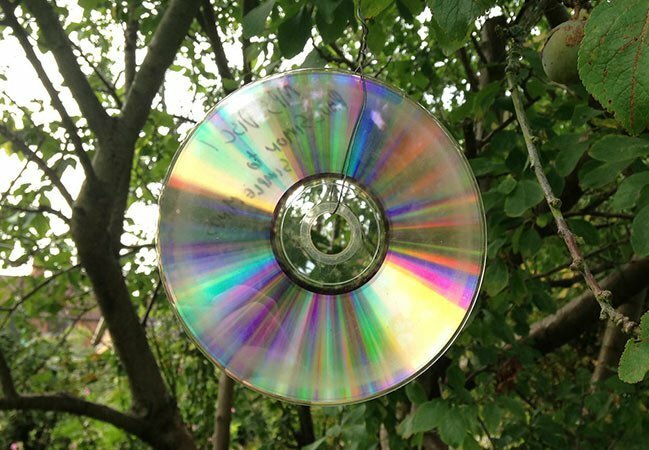 Keeping that in mind, tie old CDs by string in your fruit trees, bushes, or elsewhere in your garden. Their reflective surfaces will flash light as they move in the breeze, scaring birds away. It’s more difficult to move these about once tied in, but some people say that leaving them in one place works just fine. The sudden sound and movement of windchimes can scare birds too. If you’re going to use them, make sure to put them out in the garden rather than just on the porch. If you can find some made out of shiny metal, even better. 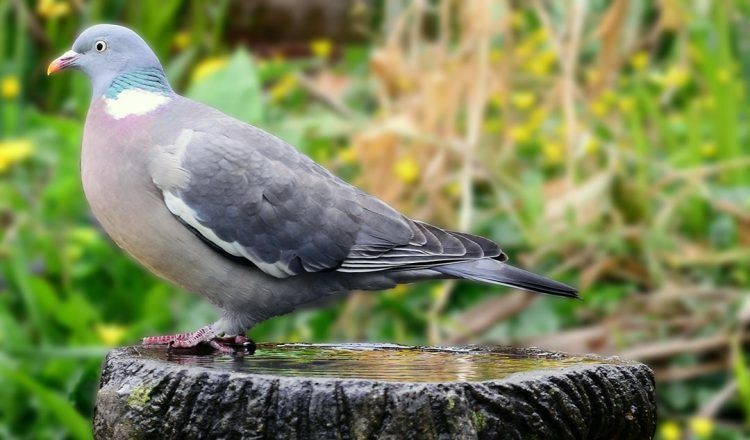 Push twigs and sticks all around your plants and they work in two ways to keep birds off. First of all, they’ll disguise the plants from above. 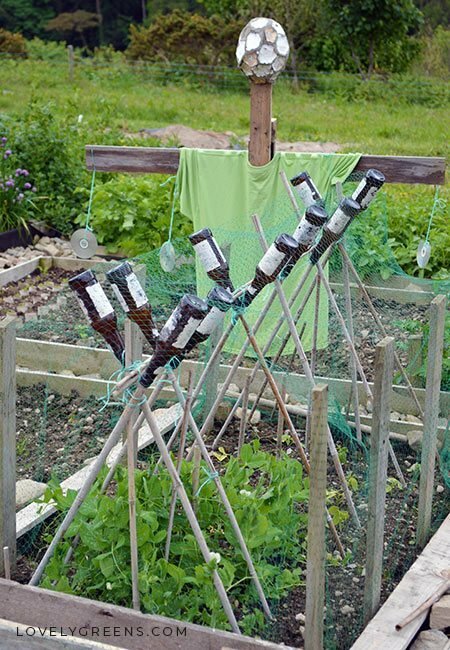 A flying bird will look down and see a mess of sticks with some green underneath, rather than tasty broccoli seedlings. On the ground, a barricade of sticks can make it difficult for birds to reach your plants. It can be difficult for you to reach them too, either for harvesting or weeding. 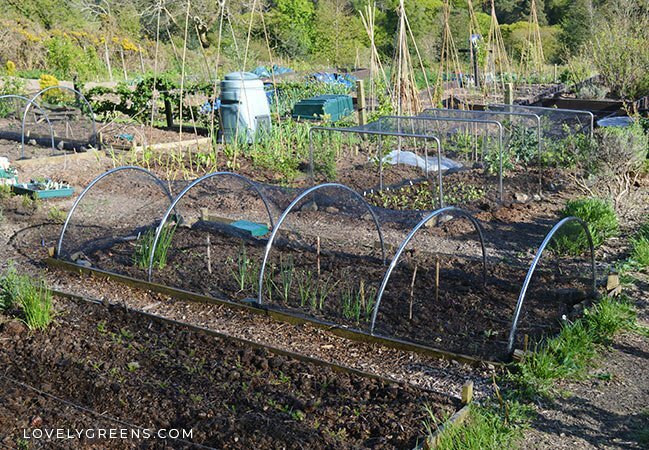 I use this method for generally two cases — for young plants that need temporary protection, and for young peas. 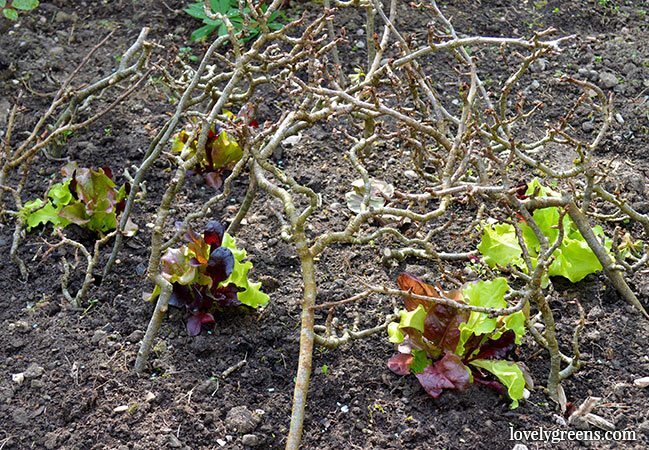 Head over here for some fun and creative ways to use sticks and twigs in the garden. The best way to scare away birds is with a real predator. A supervised dog will delight in chasing any birds off for you. In my experience, unsupervised cats can also do the trick but that’s opening up a whole other can of worms. We’ll save cats in the garden for another piece. The last tactic is to relocate your troublesome birds. 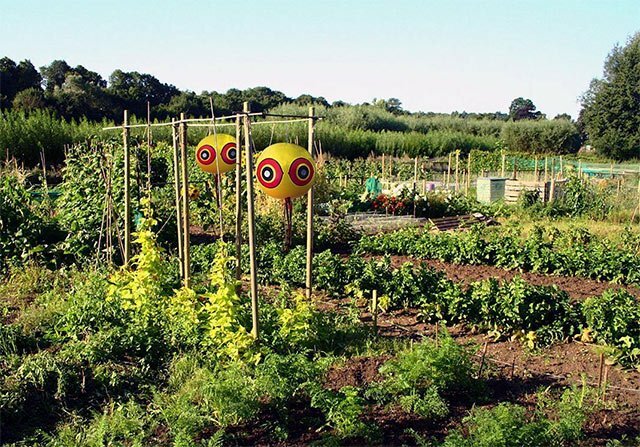 This is something that we plan on doing at our community garden this year after our recent pheasant population explosion. Live traps can catch feral chickens and pheasants but it may be a waste of time with others. Pigeons and magpies will likely fly back home.